In a joint press conference with Chinese President Hu Jintao, President Obama called for further dialogue between China’s government and representatives of the Dalai Lama. US President Barack Obama took the opportunity of a joint press conference with Chinese President Hu Jintao on 19 January 2011 to say that the United States supports "further dialogue between the government of China and the representatives of the Dalai Lama to resolve concerns and differences, including the preservation of the religious and cultural identity of the Tibetan people." President Obama said, "I reaffirmed America's fundamental commitment to the universal rights of all people. That includes basic human rights like freedom of speech, of the press, of assembly, of association and demonstration, and of religion -- rights that are recognized in the Chinese constitution. As I've said before, the United States speaks up for these freedoms and the dignity of every human being, not only because it is part of who we are as Americans, but we do so because we believe that by upholding these universal rights, all nations, including China, will ultimately be more prosperous and successful." The Tibet reference came in the opening remarks after President Obama revealed that the United States and China have agreed to resume formal dialogue on human rights and to new exchanges to advance the rule of law. President Obama said, "And even as we, the United States, recognize that Tibet is part of the People s Republic of China, the United States continues to support further dialogue between the government of China and the representatives of the Dalai Lama to resolve concerns and differences, including the preservation of the religious and cultural identity of the Tibetan people." This is the eighth meeting between the two presidents. 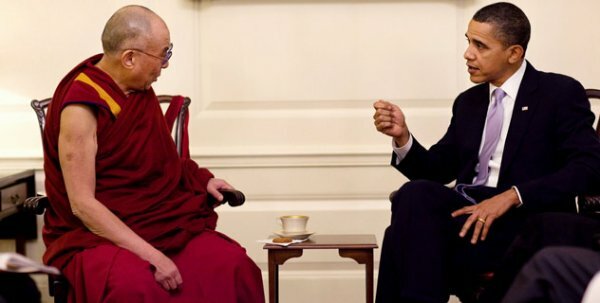 Following President Obama's meeting with His Holiness the Dalai Lama in February 2010, the White House had released a statement, which said, "The President stated his strong support for the preservation of Tibet's unique religious, cultural and linguistic identity and the protection of human rights for Tibetans in the People's Republic of China. The President commended the Dalai Lama's "Middle Way" approach, his commitment to nonviolence and his pursuit of dialogue with the Chinese government."